According to Apple, we are living in the post-PC era. Unfortunately, mobile devices, as convenient as they are, can’t perform every function as easily as their desktop counterparts. But thanks to developers like Readdle, the iPad is becoming a productivity powerhouse. If you use your iPad for any sort of document management, you’re probably familiar with Readdle’s suite of iPad apps. We’ve reviewed a few of them here. PDF Converter slides nicely into the Readdle stable as a well designed, super functional tool. If you have documents that need converting to PDF, this is the app you’ll want. PDF Converter’s user interface will be home to any who’ve used Documents or PDF Expert. On the left side of the screen resides the menu with multiple ways of importing files into the app. The main pane on the right shows the particular file you’re working with. The easiest way of getting files into PDF Converter is, perhaps, the iOS system-wide “Open in…” method. 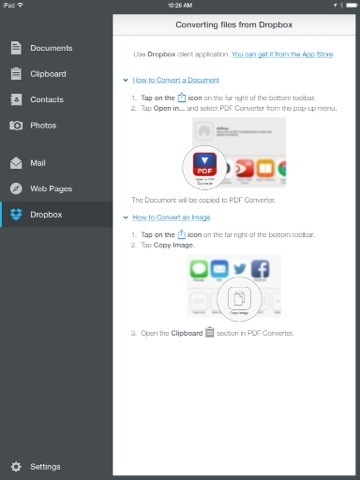 From any other app on your iPad, you can usually tap the share button and then select “Open in…” PDF Converter. The file will then be imported into PDF Converter and then converted to PDF format. Its pretty straight forward. But you can get files into PDF Converter by other means as well. The left side menu offers importing copied information from your clipboard. You can also convert any images in your photo library into a PDF. Currently, I’m working on assembling my family’s Go Bag. One of the items I need is a printed list of contacts. PDF Converter will perfectly assist me with this. From within the app you can access all your contacts and convert them to a nicely formatted list, which can then be printed off. If you have the need to convert a webpage into a PDF, no problem. Just use the handy Safari extension. The extension can automatically convert individual webpages into PDF documents. These PDF documents can then be stored in Readdle’s other apps like Documents and PDF Expert for reading offline. For more information on how to use extensions, visit this page. Once you’ve converted your file, you’ll probably want to work with it in another app. On the right side of your PDF you’ll be presented with a few sharing options. 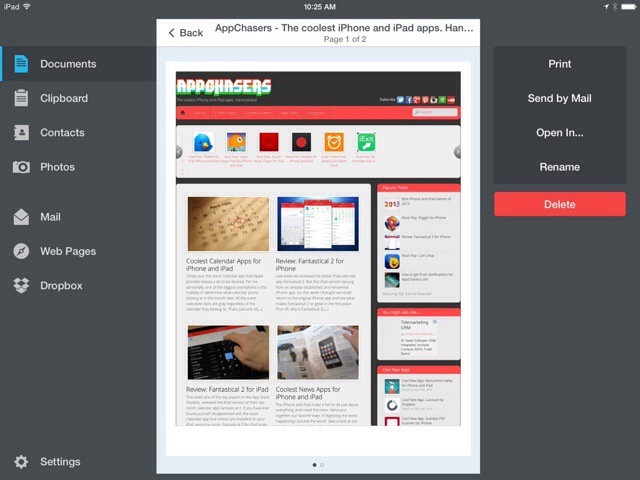 You can print it, email it, or open it in another app on your iPad. If you have Readdle’s great file organization app Documents already installed, you can convert files right within that app using the power of PDF Converter. Readdle has really designed a fluid suite of productivity apps. If you need to convert a bunch of Microsoft Office files into PDFs, this app is the only one you’ll need. I really enjoyed the review. Then I realized you were my spiritual brother when I saw talk#19 and the link to Watchtower Library Online. That made the review even better. What I really want to know is, will this app convert PDFs into jpg files? Nice review. One minor quibble, however: at approximately 4:43 in the video, you demonstrate typing “pdfhttp://www” at the beginning of the web address, verbally referring to the “//” characters as backslashes and referring to the “:” as a semicolon. The “//” characters are slashes (or forward slashes), not backslashes. Backslashes are “\\”. The “:” character is a colon, not a semicolon. Otherwise, good review, thank you. Great catch Randy! Thank you for the correction.